In the current paper, they also consider a simpler model where there is neither a drastic bottleneck, nor fragmentation, and, in fact, find this simpler model to be preferable to the others on the basis of their resequencing data. The choice of mutation rate can impact the results and because there is a 2-3 fold di erence between the mutation rate estimated from mother-father-child trios (or quartet) ( ~10^-8=bp=generation; The 1000 Genomes Project Consortium 2010; Roach et al. 2010) and the mutation rate derived from human-chimp comparisons ( ~2.5x10^-8=bp=generation; Nachman and Crowell 2000; Fagundes et al. 2007; Gutenkunst et al. 2009; Laval et al. 2010), we considered both estimates of the mutation rate in our analyses. Our fi ndings are consistent with this hypothesis, but, depending on the mutation rate, we find either an eff ective population size of NA = 12,000 (95%C.I. = 9,000-15; 500 when averaging over all three demographic models) using the mutation rate calibrated with the human-chimp divergence or an e ffective population size of NA = 32,500 individuals (95%C:I: = 27,500-34,500) using the mutation rate given by whole-genome trio analysis (The 1000 Genomes Project Consortium 2010) (supplementary fi gure 4 and table 6, Supplementary Material online). Relating the estimated eff ective population size to the census population size during the Pleistocene is a di cult task because there are many factors a ecting the e ective population size (Charlesworth 2009). Nevertheless, based on published estimates of the ratio between e ffective and census population size, a comprehensive value on the order of 10% has been found by Frankham (1995). This 10% rule roughly predicts that 120,000-325,000 individuals (depending on the assumed mutation rate) lived in Sub-Saharan Africa some 130 kya. Assuming that the range of humans extends over all the 24 millions km2 of Sub-Saharan Africa, the density of humans at that time would have been extremely low between 0.5 and 1.4 individual per 100 km2, which is even lower than the lowest recorded hunter gatherer density of 2 individuals per 100 km2 reported for the !Kung (Kelly 1995) and the density of 3 individuals per 100 km2 estimated for Middle Paleolithic people (Hassan 1981). However, this discrepancy disappears if humans were restricted to an area some 3-6 times smaller than the entire Sub-Saharan Africa. A plethora of modern humans in a "Green Sahara" prior to the most recent Ice Age, which expanded into the Near East and gave us Skhul/Qafzeh/Jebel Faya/Nubian Complex. The authors of the current paper do not contest that there was an Out-of-Africa bottleneck; they are arguing that there was no In-Africa bottleneck leading to modern humans. According to my thinking, the Out-of-Africa bottleneck actually occurred in Arabia c. 70kya. A Green Sahara would fit the bill for a geographically limited area within Africa that would support a large population at comparable densities to modern hunter-gatherer populations of Africa. Ultimately, the puzzle of human origins can only be solved by a combination of genetics, archaeology, and palaeoanthropology. Based on the accumulation of genetic, climatic and fossil evidence, a central theory in paleoanthropology stipulates that a demographic bottleneck coincides with the origin of our species Homo Sapiens. This theory proposes that anatomically modern humans – which were only present in Africa at the time – experienced a drastic bottleneck during the penultimate glacial age (130-190 kya) when a cold and dry climate prevailed. Two scenarios have been proposed to describe the bottleneck, which involve either a fragmentation of the range occupied by humans or the survival of one small group of humans. Here, we analyze DNA sequence data from 61 nuclear loci sequenced in three African populations using Approximate Bayesian Computation and numerical simulations. In contrast to the bottleneck theory, we show that a simple model without any bottleneck during the penultimate ice age has the greatest statistical support compared to bottleneck models. Although the proposed bottleneck is ancient, occurring at least 130 kya, we can discard the possibility that it did not leave detectable footprints in the DNA sequence data except if the bottleneck involves a less than a 3 fold reduction in population size. Finally, we confirm that a simple model without a bottleneck is able to reproduce the main features of the observed patterns of genetic variation. We conclude that models of Pleistocene refugium for modern human origins now require substantial revision. "Assuming that the range of humans extends over all the 24 millions km2 of Sub-Saharan Africa, the density of humans at that time would have been extremely low between 0.5 and 1.4 individual per 100 km2"
But that population is unlikely to have been distributed evenly through the whole of Sub-Saharan Africa. Populations would have been greater in the most desirable habitats although quite capable of meeting and mixing on occasion. The population may have been kept in check by greater predation than later became the norm as humans learned to kill predators more effectively. There is no fossil evidence of a bottleneck in human evolution in Africa during the Pleistocene. However, Homo and his lithic culture does appear almost out of nowhere around 2.6 million years ago. So the bottleneck obviously occurred in the Pliocene-- not the Pleistocene. One won't really expect an ice age to create a bottle neck in Sub-Saharan Africa which is probably more insulated from global cooling effects than anyplace else on the planet. The folks who we would expect to bear the brunt of that event would be the archaic hominins of Eurasia. I concur with terry that a uniform population distribution in Sub-Saharan African is deeply implausible (consider how very lumpy the population density of Sub-Saharan Africa is even today), and that the contrary assumption that 120,000-325,000 people (probably closer to the low end than the high end since the human source data is probably more accurate than the chimp data for this purpoose) occupied only a third to a sixth (probably closer to a sixth than a third) of Sub-Saharan Africa makes sense. Indeed, using the !Kung (Kelly 1995) as a hunter-gatherer benchmark for population density is probably too low. They live in a desert hostile to human habitation are able to continue a hunter-gatherer lifestyle there only because it is so sub-optimal for modern humans that even people with the capacity to kick them out haven't been bothered; ditto the Pygmies. But, the populations of modern humans that thrived before there was competition from food producers would have staked out the prime turf that would have had much higher carrying capacity. Even the density of 3 individuals per 100 km2 estimated for Middle Paleolithic people is probably low for that population. One would want to look at the more successful pre-food production populations of the Americans (e.g. the Clovis) for better estimates, and a density of 5-10 per 100 km2 might be better for a population of modern humans in the actual "Garden of Eden" that we originally evolved in and prospered from enough to survive, dominate and expand, which would narrow the core range of this 130kya population of modern humans to something closer to 5%-10% of sub-Saharan African, with pockets here and there in sub-optimal areas. 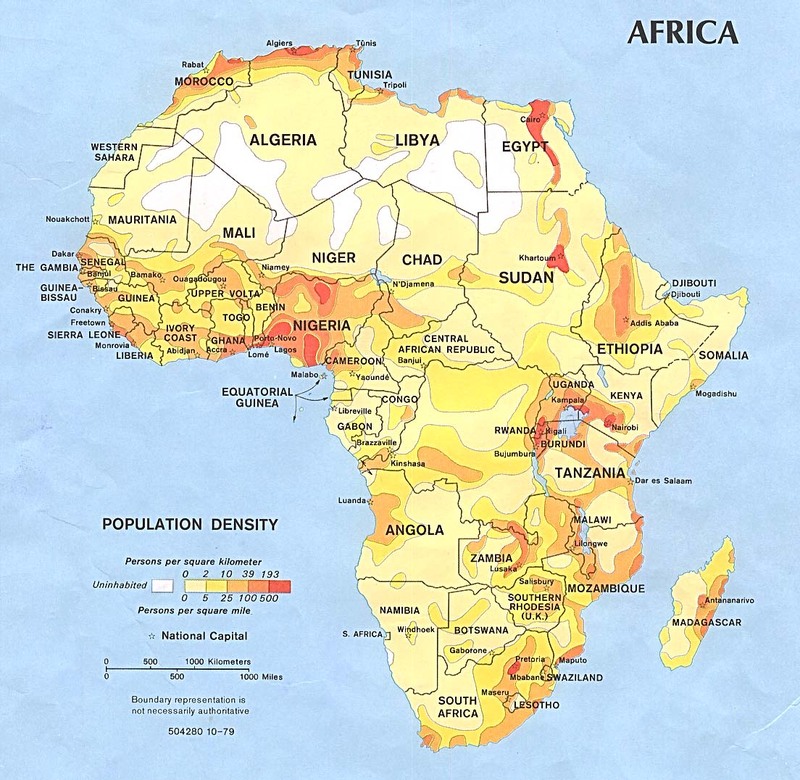 As a first approximation guess, assuming that perhaps 150,000 modern humans (census population) are spread in proportion to the modern population density of Africa, with a floor of perhaps 2 per 100km2 for a sustainable population of any modern humans in a particular area, would probably be a pretty realistic guess. This would imply high population densities in the vicinty of Nigera and the African Great Lakes, and moderate population densities in the remainder of West Africa, Southeast Africa and Ethiopia. Meanwhile Southwest Africa (including the Kalahari desert), Central Africa (basically the Congo jungle) and Somolia would be virtually vacant. Also the fact that there is no sign of a bottleneck in modern human genomes is somewhat deceptive. Populations in sub-optimal areas that went extinct in hard times, the ultimate population bottleneck, would be invisible to this methodology since their genes would not have penetrated at all into the modern gene pool. If there was a modern human bottleneck due to an ice age, it seems more likely that entire ill located communities died off, e.g., because the river they rely on for water dries up and reduced water and food supplies, bringing a population on the brink below a sustainability threshold and throwing them into a vicous downward cycle, and that they didn't manage to find a new home fast enough; as opposed to a bottleneck through a deterioration of some prime modern human habitat (probably home to the majority of all modern humans 130kya) so bad that the population fell by more than two-thirds (the limit on what modern genetic data could show). "Homo and his lithic culture does appear almost out of nowhere around 2.6 million years ago". Not really 'out of nowhere'. There had been no end of Australopithecus wandering around, and it is often difficult to assign species at the cusp to genus 'Homo' or genus 'Australopithecus'. "the contrary assumption that 120,000-325,000 people (probably closer to the low end than the high end since the human source data is probably more accurate than the chimp data for this purpoose) occupied only a third to a sixth (probably closer to a sixth than a third) of Sub-Saharan Africa makes sense". "Anyone who takes any molecular clock estimate seriously is seriously fooling themselves:-)"
True, but the sequence survives as a realistic piece of evidence. Disregarding the weaknesses of the molecular clock I notice from Maju's diagrams that no L haplogroups can be placed either in the tropical rainforest of the Congo Basin or on the open savannah/grassland of Chad/Birkina Faso before the 23 mutation level. But by that time modern haplogroups can be placed in Ethiopia, as far west as Gabon (but not beyond till later) and as far south as the people who later became Khoisan. So that considerably narrows down the area the '120,000-325,000 people' were spread through. "Indeed, using the !Kung (Kelly 1995) as a hunter-gatherer benchmark for population density is probably too low. They live in a desert hostile to human habitation are able to continue a hunter-gatherer lifestyle there only because it is so sub-optimal for modern humans that even people with the capacity to kick them out haven't been bothered; ditto the Pygmies". "This would imply high population densities in the vicinty of Nigera and the African Great Lakes, and moderate population densities in the remainder of West Africa, Southeast Africa and Ethiopia. Meanwhile Southwest Africa (including the Kalahari desert), Central Africa (basically the Congo jungle) and Somolia would be virtually vacant". That is centred on, but a bit more extensive, than what Maju's data suggests. That data inplies that humans at the time were confined to a narrow ecological region, presumably the margin between grassland and forest. They were unwilling to move further into either extreme until the time that L3 (and several others) expanded. "Also the fact that there is no sign of a bottleneck in modern human genomes is somewhat deceptive. Populations in sub-optimal areas that went extinct in hard times, the ultimate population bottleneck, would be invisible to this methodology since their genes would not have penetrated at all into the modern gene pool". Whoa there… human foragers tend to have extremely far flung networks of gift exchange and trade, and reciprocal access to resources. This is one of the kay human adaptations to foraging. It is not impossible for local populations to die out due to local droughts and other natural disasters, but increasingly unlikely as the forager economy forged Anatomically Modern Humans. That is the whole point of greater cognitive abilities and a longer childhood. Being able to handle many different languages, and learn and adapt correct behaviour in a variety of different cultural settings, did not evolve without considerable selection pressure. "Whoa there… human foragers tend to have extremely far flung networks of gift exchange and trade, and reciprocal access to resources. This is one of the kay human adaptations to foraging". True, but at what stage in our development did we adopt such behaviour? Neanderthals don't seem to have used it so presumably early 'modern' humans didn't either.